I have just returned from an amazing week in Northumberland – yes you heard me right! The last time I visited Northumberland was when I was about 10. The opportunity to visit the area again recently raised my curiosity. As a child you are happy messing about in the sea and sand eating ice cream. The thought of doing this in the middle of winter as an adult left me chilly. 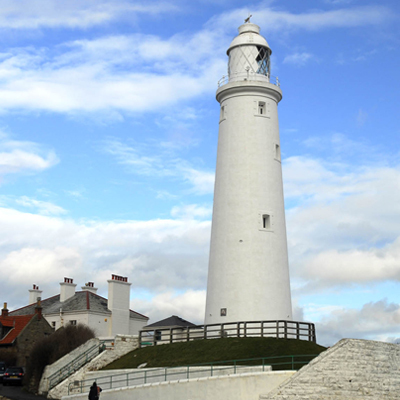 Our journey started on the way to Northumberland with a stop at Whitley Bay a pretty little seaside town with a lighthouse on St Marys Island. Which at low tide you can walk to. Our trip then took us to our base destination Wooler. Well, what a great little place. Everything you could need. Several really nice pubs, a deli, great little shops, amazing walks and a really friendly atmosphere. Over the week we visited Berwick upon Tweed, Banburgh and Alnwick. All of these places are really worth a visit. There are several great restaurants and gastro pubs in the area. ence the light festival is held in Northumberland during winter months. Forests, monuments and parts of Hadrians wall (amongst others) are all lit with coloured lights to create mood and drama – the results are amazing. And guess what – messing about in the sea and sand eating ice cream is just as much fun now as it was all those years ago, even in November! Give Northumberland a visit it may surprise you – it did me!